what we consider to be above the poverty line. a tattered tin roof, the throne of the cat. sitting where my ancestors sat? to this new world, this new land. So close and yet so far apart. It’s same backdrop as mine. and my people made a thousand times before. but what if we both win? frogs singing, rejoicing, lifting one voice. swirling together, a masterpiece, a Krewe. What is the price of being awake? or a politician’s skeptical pocket book? because who needs change anyway? who have lost the knack for memorization. taking a whiff of the history in fine cursive lines. because that is what we are expected to do. but We are n o t f o o l e d.
if light is even what we think it is. the maze of roots rooted in the ground. the base of all where Life begins and falls. All from a singular being, swollen with watery pride. Is it a nest or a tomb this watery grave? crying out in hunger for the first or the last time? made from sweat and tears for 9 months and 18 more or less years. and all those fortunate enough to witness it? playing tag throughout the galaxies. no matter who we have killed. that will be our demise. I would wear shorts more often, bikinis, tight fitting clothing. I would take more physical risks. Tan parts that have never met the sun. I would eat and drink strange and unusual things; things my body rejects. Things my self rejects and society rejects. Though I come from a bit of a melting pot of ethnicities, most of my lineage, in fact just about half, is French. My father’s maternal line is French Canadian and both of my mother’s parents have French lineage in New Orleans directly from France and from those who relocated to New Orleans from French Canada. I always felt that if I searched deep enough, I would find a common ancestor between my mother and father. The French colonization of Canada was isolated to a very small region. Surely, there was bound to be a crossover! Ding! Ding! Ding! SUCCESS! I’ll take 9th Great Uncle Grandpa for $500, Alex! I found a glimmer of a possible connection on a late night Ancestry.com binge a few years ago. However, trying to unravel 300 years of lineage crossover hurt my brain. There wasn’t a computer screen big enough to zoom out as much as I needed to compare the lines. I’ve had a pin on the task of tracking down the exact person that linked my mom and dad but I have been distracted with other parts of my lineage. In my research for this blog post, in which I had no intention of talking about the possibility of my mother and father being related, I accidentally stumbled across the answer! What do they say about finding something when you stop looking? A watched pot of water never boils? Something like that! But before we get into more about my 9th great Uncle Grandpa Jean, let’s talk about his great-grandparents and their children and grandchildren, whom this blog was originally intended to be about, Nicholas Hébert and Jacqueline Pajot. Jacqueline Pajot was born c. 1544 right at the height of the European Renaissance in the St. Gervais or The Marais neighborhood in Paris near the Place Baudoyer to bourgeois candle maker, Simon Pajot, and his wife Jeanne Guerineau. This was a time in French history where Paris was the largest city in Europe and was a hot spot for social, political, religious, and artistic change and growth. Discovery and innovation were the theme of this century. During Jacqueline’s lifetime she saw the first street lighting by candles, the first theatre open, the first ballet performance, the beginnings of primary and secondary education, and the growing importance of merchants, especially those who made household items, like her father. I imagine Simon stayed quite busy since the city administration decreed in 1524 that lanterns with lit candles should be hung in front of houses at night. By 1594, a new decree from the police called for lanterns to be hung in the streets of each quarter, with city officials designated to see that they were regularly lit. At the end of the 15th century, another new industry was born: the printing of books. By the 16th century, Paris was the second most important center of book publishing. In 1500, there were 75 printing houses, second only to Venice. In spite of their growing popularity, books were still considered luxury items. They were printed and sold in the neighborhood nearest the University which was about 2 miles from where the Pajot’s lived on the other side of the Seine. The growing availability of books increased the desire for primary education. Most noble families had private tutors for their children. Schools were organized by the church and were for boys only. As religious reform was growing, many Protestant schools were popping up and sometimes even included girls! However, this wouldn’t have applied to Jacqueline as her family practiced the religion of the Crown, Roman Catholicism. Jacqueline would have perhaps studied with the Ursulines, a religious order for women that provided secondary education for young women, however, the curriculum was limited to reading, writing, sewing and embroidery. King Francis I helped strengthen the city’s position in scholarship and learning. In 1530, the King created a new faculty at the University of Paris with the mission of teaching Hebrew, Greek and mathematics. Though the growth of the University had positive effects for many, it had a darker cause as well that would be the beginning of a dark time for Parisians for years to come. The University devoted much of its attentions on fighting Protestant heresy. Throughout Jacqueline’s life, she would see a continual increase of tensions between the Protestants and Catholics that would greatly impact her later. As mentioned before, the Pajot’s were devout Roman Catholic’s as most “good” families were in Paris in the 16th century. They are listed as parishioners of Église St. Gervais. The Église St. Gervais is a perfect representation of a church in that era with a melange of Gothic and renaissance features. The lower nave and the choir stalls, which featured hand carved scenes of daily life, different professions of the time, and various animals, represent the leftovers of the late Gothic style. Though the chapels were complete in 1530, the facade wasn’t constructed until the early 17th century, after Jacqueline died. The facade features an “up-to-date” design more reminiscent of the architecture of the renaissance era, more specifically known as French Baroque. It was at Église St. Gervais that Jacqueline is said to have been married at least 2 times. I can not find any record of her first husband. Her second husband is documented as Louis de Cueilly. They were married in about 1555. They had 3 children. In my research, I have found varying information about Jacqueline’s birth date. Different sources range anywhere from 1535-1547. It is documented that she was widowed 3 times before marrying her third husband, Nicholas Hébert, in 1564 at Église St. Germaine de Prés, a 6th century abbey on the Left Bank of Paris. If Jacqueline was born closer to the later estimated dates, that would mean she would have been married three times with multiple children all by the age of 17. Though this seems extreme for us in the 21st century, it wasn’t too uncommon in the mid 16th century. The legal marriage age for women was 12, however most women didn’t marry until their early 20s unless they were from a wealthy family, like Jacqueline. It was with her third husband, Nicholas, with whom she would mother children of importance to my family history and the history of many families in the New World. Nicholas Hébert was born in 1547 to Johannes and Joanna Hébert in Paris. He was an apothecary, grocer, and spice merchant. In fact, he succeeded Michel de Nostradame, more famously known as Nostradamus, as chief apothecary and court physician to Catherine de Medici, Queen of France, after Nostradamus’ death in 1566. (If any of you are as big of fans of CW’s Reign as I am, you know how exciting this discovery is!!!) Nicholas owned the Coeur Royal, the Trois Piliers, and the Mortier d’Or at 129 Saint Honoré St. 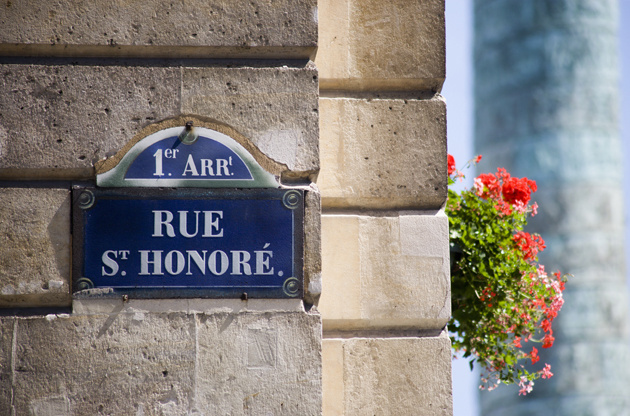 Many notable historical moments occurred on Saint Honoré Street. It was on Saint Honore St. that Joan of Arc was wounded in 1429. At 9 Saint Honoré St., in 1610, King Henry IV of France was assassinated by a Catholic zealot. At 92 Saint Honoré St., 15 Molière, the playwright, was born in 1611. Emmanuel Joseph Sieyès, clergyman and political writer during the French Revolution, lived at 273 Saint Honoré St. Maximilien de Robespierre was sheltered by Maurice Duplay at 398 Saint Honoré St., where he was later picked up by the cart which took him to the guillotine on the Place de la Concorde in July 1794. It was at 129 Saint Honoré St. that Nicholas and Jacqueline’s children, Charlotte, Jacques, Louis, and Marie, were born and raised. The Mortier d’Or was a large three story house built in 1415 for wine merchant, Jehan de Paris. It was made of freestone with two separate living quarters. The ground floor housed the store where Nicholas dispensed his spices and medicines. His son Louis followed in his father’s footsteps and learned the apothecary trade. He assisted his father at the French Court. They are almost certain to have had unusual access to the palace. To this day, the ground floor of 129 Saint Honoré St. still serves as a vitamin and supplement shop. As with many of the bourgeoise, Nicolas supported the Guise (Catholic League) in the Religious Wars. He soon found himself in financial trouble and was forced to sell one of his estates, the Coeur Royal. In 1570, Nicolas had to mortgage Mortier d’or. In 1572, Jacqueline’s mother, Jeanne, was very ill and dying. On October 3, 1572, Jeanne had her will drawn up. She had stated that all goods that belonged to her would go to her son Isaac, who was 23 at the time and living with her. To avoid any difficulty, she specified that “all the wood of chêne (oak), water, and house as far as can be seen” would belong to Isaac. However, she had named Nicholas Hébert the executor of her will. Jeanne died a few days later and on October 16, Nicholas drew up the inventory of goods from her estate. In her will she stated that above all she wished that her children live in friendship without argument or difference, which it seems is one of many wishes they didn’t respect. Isaac, being the eldest son, was unhappy with how Nicholas had divided Jeanne’s goods. He demanded to see his mother’s will, which Nicholas, as executor, continued to put off. Isaac wasn’t satisfied with Nicholas’ procrastination so he tried to speed up the process by involving the provost. He claimed that he and his other siblings were owed various sums of money and objects from Jacqueline’s estate. The matter was to be settled out of court, but it would only add to Nicholas and Jacqueline’s already struggling financial situation. Isaac realized that the price of conducting business through the provost was such a large expense and it would be more than the sum of what he believed to be owed anyway, so he dropped it. They eventually came to an agreement and made appropriate divisions among all of the siblings in the amount of 150 pounds. However, the next year, all of the family mutually decided to turn against Nicholas and Jacqueline once more. They approached the provost with a different charge and yet again came to an amicable agreement. A significant sum of money would be distributed equally between the Pajot children. After his wife’s “mysterious” death, Nicholas hired Jehan de Paris to tutor his children. He remarried 2 years later to a widow named Marie Auvry. Some of Nicholas’ goods were seized over an inheritance issue with a new sister-in-law. Nicholas was on the verge of bankruptcy. He had to borrow heavily and when he found that he was unable to meet his commitments, he was taken to court and forced to sell his remaining shares in Mortier d’Or. However, even that was not enough to settle his debts and he was sent to prison for two years in the Chatelet. When he was released, he was very ill and his second wife had passed away. Around 1589, Nicholas married for the third time to a Renee Savoreau. She had many financial interests in the Chartres region. (I’m sensing a common theme here). He lived out the rest of his days in St-Germaine-des-Pres until his death in January of 1600. Though Nicholas and Jacqueline’s stories both seem to have come to a sad and untimely end, their descendants went on to leave their mark on the world, specifically the “New World.” Their son Louis, who learned his father’s trade of medical arts, science, and pharmacology, is widely considered to be the first Canadian apothecary, the first European to farm in Canada, and the first colonist of Quebec. He followed his cousin on an expedition to Canada in 1606 in hopes of making a fortune in the fur trade. However, as a pharmacist, he seemed to be more interested in plants and horticulture. He was highly regarded and particular note was made of his knowledge and pleasure in cultivating the land. In 1617, Louis was the first private individual to receive a grant of land in the New World from the French government. On April 11, 1617, Louis, his wife, Marie, and 5 other French families set sail on the Saint-Etienne for Quebec. Louis was recognized as having been of great service to the colony; for being a physician and surgeon, for being the principle provider of food, and for having fostered good relationships with the natives. According to the Historical Demography Research Program of the Université de Montreal, Louis and Marie are considered the tenth most important couple in French-Canadian ancestry at that time, with 4592 descendants by 1800. There is a statue of Louis and Marie in Montmorency Park. So what does all of this have to do with my 9th Great Uncle Grandpa? Well, Nicholas and Jacqueline had another son, Jacques Hebert. Though Jacques might not have been as historically significant as his brother Louis’, it turns out he is pretty significant in my family history. Jacques had a son named Antoine. Antoine had a son named Jean and thus we meet Great (x9) Uncle Grandpa Jean! Jean was born in Port Royal, Nova Scotia in Canada in 1653. Jean and his wife Anne Doucet parented at least 13 children, hence the ancestral wires crossed in my genealogy. The Heberts on my dad’s side remained in Canada until 1887, when my great-great-great grandfather, Pierre Hebert, immigrated to Munising in the Upper Peninsula of Michigan. On my mom’s side, my Hebert ancestors were actually a part of the Ile Saint-Jean campaign, which was a series of military operations in 1758 that deported the French colonists, or Acadians, back to France as the British conquest swept through Canada. The Acadians refused to sign an oath of allegiance to the British crown which led to their eventual deportation. Of the 12 transport ships, 8 made it to France, with a death toll up to 1,500 people. One of the survivors was my 6th great grandfather, Theodore Bourg (Son of Jean Pierre Bourg and Elizabeth Hebert), who was only 13 at the time of the deportation. Theodore grew up in St. Malo, France, a port city in Brittany in Northwestern France. St. Malo had a tradition of asserting its autonomy in dealings with the French authorities and local Breton authorities. From 1590 to 1593, Saint-Malo declared itself to be an independent republic, taking the motto “not French, not Breton, but Malouin.” If anyone knows me or my family, you will know that this attitude has seemed to have survived all the way to 2017. Theodore Bourg remained in St. Malo until 1785, when Spain paid for 7 ships to transport Acadian refugees from France to settle in Louisiana. Theodore, now 39, his wife Anne, and their 3 children, Theodore (5th great grandfather), Anne, and Magdaleine, boarded the Le Saint Remi on June 27, 1785 en route to Louisiana. They arrived 75 days later and settled with several other families along Bayou LaFourche. And the rest is history! Is your head spinning yet? Mine is! Perhaps this chart will help. So there you have it! Sorry Mom and Dad, but you are cousins. Very, very, very distant cousins. Oh, and just in case that bit of news wasn’t enough to handle for one day, you two are both related to Hillary Clinton, who shares a common ancestor mentioned earlier in this post, Jacqueline Hebert’s father, Simon Pajot (remember the 16th century candle maker?). I know you will both be thrilled about that. But, at the end of the day, if you really think about it, we are all related somehow. It just takes a certain level of curiosity, stubbornness, and a yearly subscription to ancestry.com to really prove it.